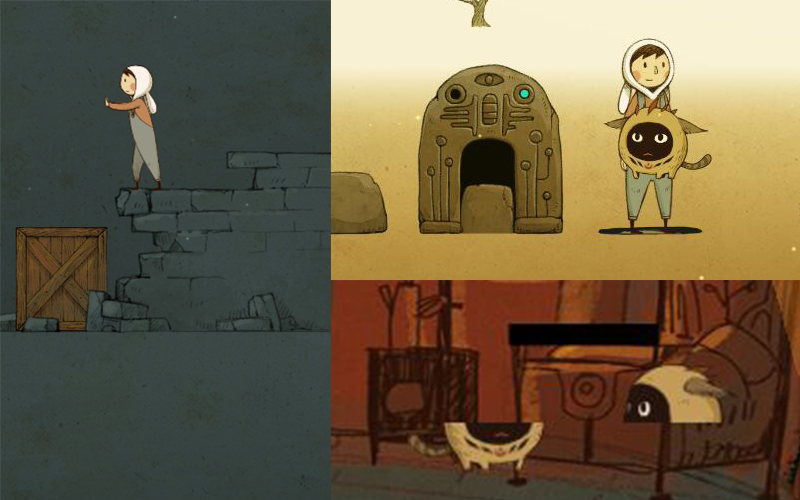 LUNA The Shadow Dust is a fully hand-animated Point&Click puzzle adventure, brought to life through wordless storytelling, beautiful cinematics and a breathtaking original soundtrack. Here comes the development update that you’ve been waiting for. We know it has been a while since we posted anything here, we do apologize for the delay! We’re full speed working on the game and the upcoming brand new demo, so let’s start the update with this exciting news! Since the release of the Kickstarter backer early bird alpha test, we’ve received a lot of very positive and valuable feedback. We were then able to improve our build based on this valuable insight. 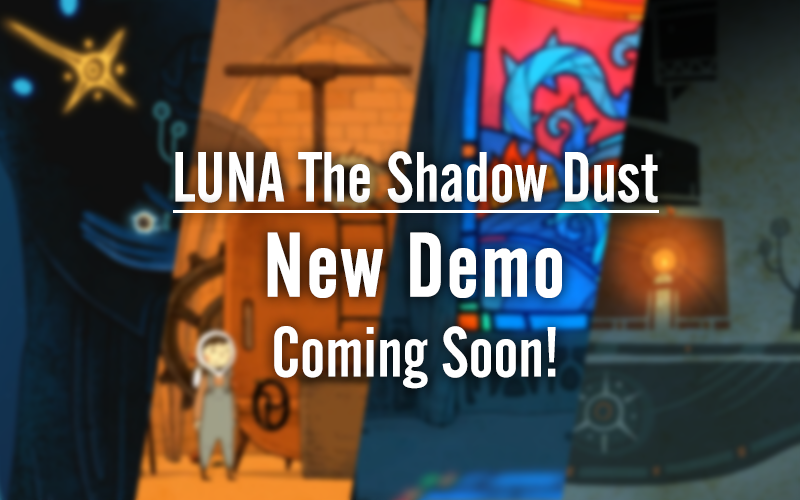 In order to reveal a little more about the world of LUNA, we've decided that before the official launch, we will present a brand new demo, featuring two new levels with four new locations. We hope this will give our players a good peek into the LUNA world. Also, this time, you will be able to fully experience our dual character control feature! So stay in touch and sign up to our NEWSLETTER HEREto be among the first to click the link and gain access! Also... New Trailer coming soon! With more new footage to play around with, we’re now not only able to update our full-length trailer but also to make a different one focusing on gameplay! It is also high-time for us to work on the marketing side. With the professional help of both our Publisher and Marketing Consultant, we'd like to come up with the best phrase for LUNA to stand out from the crowd. What's your favourite element in LUNA and what will be the part that most excites you? Leave a comment below and let us know! Now, let’s see what has been achieved on the remaining game production work. During the past few months, we finally reached our 3rd milestone! Now ALL the cinematic animations are completed with music! Along with the progression of the story, players will be presented with 6 visually stunning wordless cinematics, adding up to a total of 20+ min long 2D hand-drawn animations to experience! This is something we truly believe to be special about LUNA, it is not easy to complete such a quantity of cinematics with just one artist and one music composer, but we did it! Moreover, the team had been working on this game for a long time, even though when we first watched the full animation, we all still can’t help but felt deeply touched by the stories of these two beloved characters in LUNA. We sincerely hope that we can share this warm feeling with you in the final game. 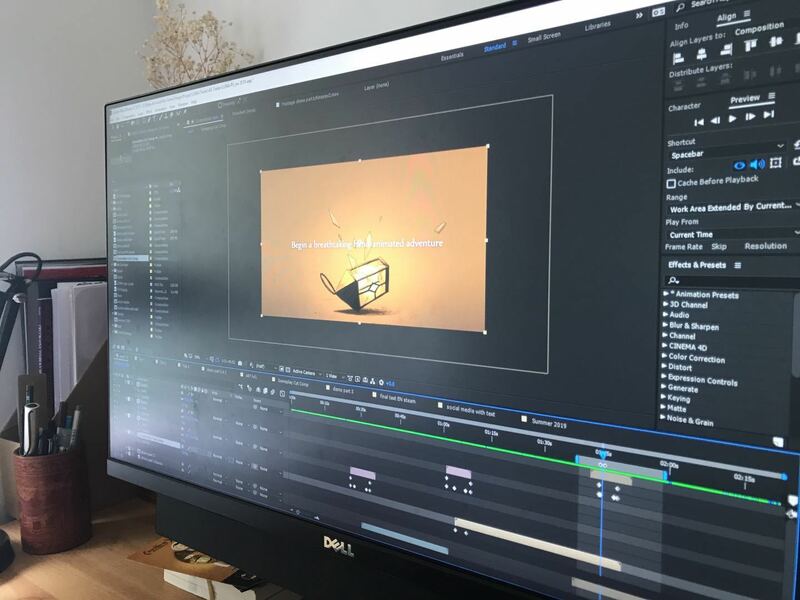 Now, as we are reaching the end of the production, it’s time to focus on the final touches within the limited time available to reach as closely to the to the perfect standard we hope to achieve. We’ve been also working on stuff like level load times, progress saving, menu and interface etc., improving the recognition level of all the interface button/icons. We’ve been testing all these system-related features, hoping these basic functions do not interfere with, but aid players’ in-game experience. Meanwhile, sound design is still in process. It's halfway through and goes hand-in-hand with music optimization. We want to make sure that all the animation, SFX and music work in a harmonious way. Therefore we strongly suggest playing the demo (and the final game) with your best audio system or headphones! Last but not least, we‘ve started the most crucial step before the game’s release: debugging! The progress is painful but necessary. Sometimes we do find some amazing and funny bugs, but even though we love them very much, we’ll make sure you'll never bump into these bad boys! Some bug collections. The Tai-Chi Boy and Teleport beast! When the build comes to a stable stage, we will most likely to have a limited number of keys for the public beta testing. If you’d like to be part of this, we will send out the beta sign up via our NEWSLETTER, please subscribe! In the near future we are also going to Fusion G -Core exhibition in China on May 2019, and Gamescom in Germany later in the year! We know we’ve said this countless times, but still now when the game is so, so close to being delivered, we look back on our first post. It really feels like an incredible journey. We are aiming to complete the sound FX and major debugging within the 2nd quarter, preparing the soundtrack and artbook material we promised our backers and complete the Steam page related jobs (achievement design etc). We should be able to update more frequently at this point, as the heaviest production work will be close to the end. We will be more actively involved in our Steam community discussion, social media events and much more! Follow us on all our social media account below! Thank you all for being so patient and supportive, it's getting very exciting! Let us know us your crazy ideas to tell more people about LUNA; shouting "LUNA" in the neighbourhood 10 times a day? Hiring a celebrity cat on Instagram to hold our advertisement? Contacting NASA to spread the word in the skies? We’d love to be inspired! Hi everyone! It's Beidi here. When I was young, I read the story about John Dalton who described his own color blindness in 1794. In common with his brother, he confused scarlet with green and pink with blue. This story has always fascinated me, because with ‘normal’ vision, it’s hard to unsee the color you’ve seen or simply imagine seeing the world through a completely different color palette. And I’ve often wondered how can I ever be sure that the color “yellow” I see, is the same “yellow” as everybody else’s. My childhood wonder had quickly been forgotten until many years later, when we started working on LUNA. After sending out an alpha demo to players, we suddenly realized there was a particular level in the game, in which a small group of people become seriously stuck where most other players usually wouldn’t. In the puzzle, players are required to pick one particular color (the correct answer) among six different colors. To my eyes, these six colors were distinctively different from one another, however I later on found out that not everyone agreed with me. Finally I came to realize that the players who had difficulty completing this puzzle simply did not see the same color as me, either aware or unaware of their color weakness. Working as an illustrator for many years, I am so used to selecting various shades of similar colors just to make a drawing perfect to my eyes. I will easily get frustrated when prints come out just a bit darker or bluer. I actually never really truly realized how different the experience can be between people with normal vision and those with limited color recognition. Until now! 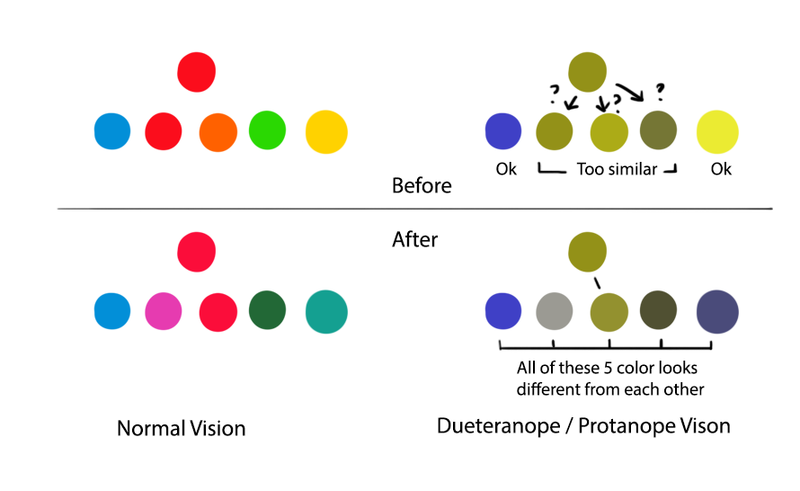 To inform my actions, I did a bit of research about the different types of colorblindness, really wanting to find a solution to a color themed puzzle that everyone could play without struggling. 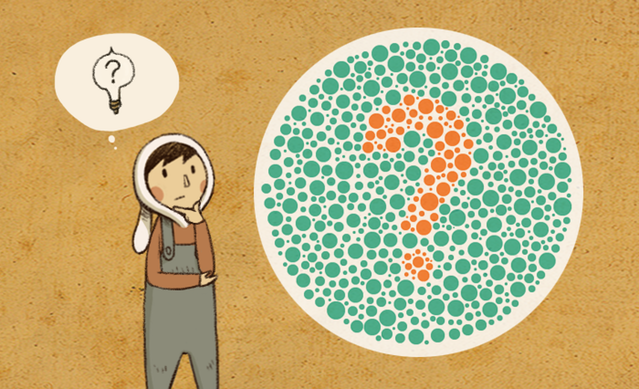 From the research, I learned there are commonly three main different types of colorblindness. 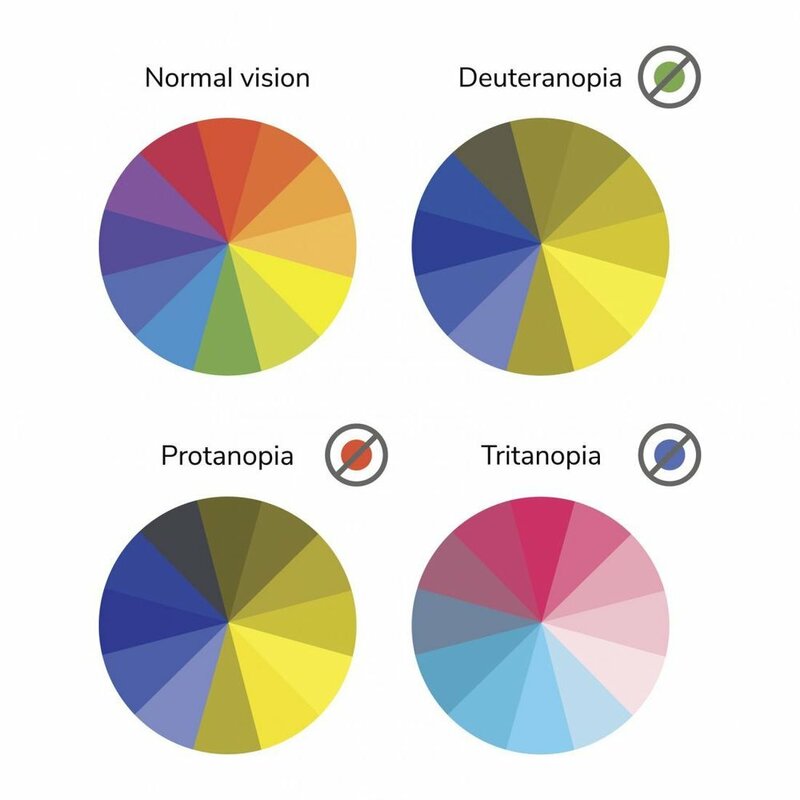 Each of them has a restricted color vision within certain range of colors. Some are not sensitive to blue and green, others find it hard to differentiate from red and purple (see image below). I realized that almost all sufferers experience issues with the color green. This was the problem with our level in LUNA, a lot of greenish colors were associated with the color picking step. If we wanted our players to be able to pick a green tone color as the correct answer to complete the puzzle, deuteranope and protanope groups of players would have difficulty figuring out the right answer. To their eye, there were other colors that appeared to be the same (see example below). Now we knew what the problem was, the next step was to redesign the colors for this puzzle. But the challenge, even now we were aware of the situation, was that there would still be no way for us to know which group of colorblind players would be playing this game. As all are sensitive to different rage of colors, simply changing from one color to another might just cause the problem for another group. We needed something for everyone. First of all, we decided to avoid putting any green tones together in the design, as all three groups of colorblind people would have issues here. Secondly, we tried to avoid primary reds and greens in the same group, next to each other, as they often appear to be very similar as well. To help colorblind players, we added a bluish tint on the original design. By doing this, it knocks them into a different color range . Now, after the changes, players can distinctively tell the difference from A and B. Last step, we re-designed the choices pool. From the previous six color choices we had before, three of them appeared very similar for colorblind players. Instead of changing the red color we wanted to use for the correct answer, we changed the other five, to make sure that all the other choices can still appear varied enough for colorblind players to distinguish within the range they can see. Although the final colors lose some of their original color tone, the answer color now looks different from the rest of other choices, and can be picked out more easily. That’s how we attempted a more color-friendly redesign! We still have to test it with players to see if it actually works as intended, and also how much it might affect the original puzzle difficulty. We hope this will make everyone’s gaming experience more enjoyable. It was a very valuable lesson we learned from the feedback we received from our recent exhibitions and shows. You guys are helping us make the game better and better. 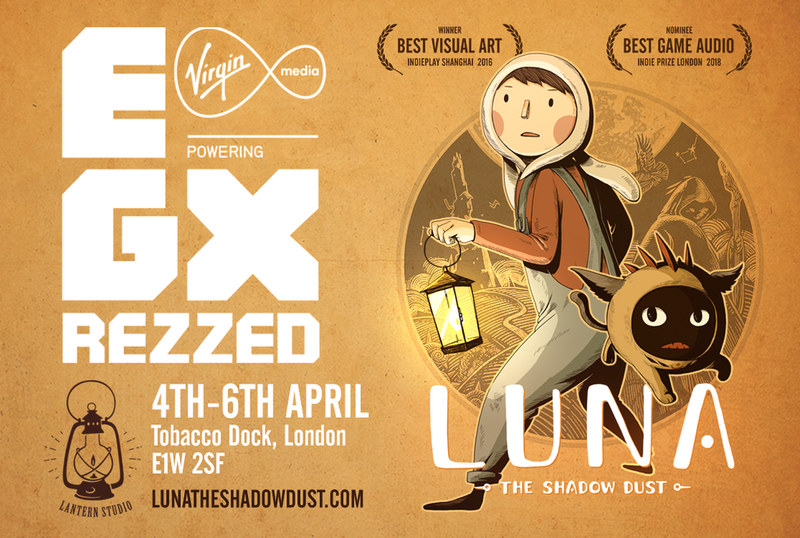 Inspired by the adventure games of old, LUNA The Shadow Dust is a moving tale of two playable companions drawn together in a hand-animated puzzle adventure, featuring a breathtaking original soundtrack and beautiful 2D cinematics. Behind the shadow of reality, an enchanted world awaits illumination. Experience the magical journey of a young boy and his companion as they solve puzzles and trace back the memories of old, brought to life with visually stunning, wordless cinematics. Enter the ancient tower that stands at the edge of the world and discover the hand-drawn cinematics, intricate puzzles and haunting music of this indie gem. 12 frames per second, 3 layers per frame. Over 250 animations and 20 minutes of cinematics. A nostalgic and time-consuming process - but really worth the challenge for a small indie team of four. Solve puzzles from different perspectives. Discover a story of true courage with two playable characters drawn together through an inseparable bond. Spark your imagination and solve a wide variety of puzzles, presented in gorgeous hand-drawn environments. Puzzles work standalone, requiring no 'hidden items' or player backtracking. We replaced a dialogue system with a series of beautifully hand-animated cinematics telling a mysterious story. Our composer created an original soundtrack, designed to immerse the player in the emotional highs and lows of the story, kindling goose-bumps along the journey.